DALLAS – The Army & Air Force Exchange Service made dreams come true for three grand-prize winners of the MILITARY STAR® “Your Holiday Bill Is On Us” sweepstakes—and for one young Soldier from Fort Bliss, winning has changed her life. As a grand-prize winner, Sgt. 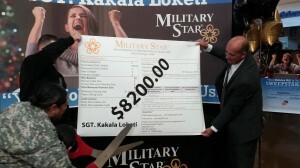 Kakala Loketi had her MILITARY STAR® account paid in full. 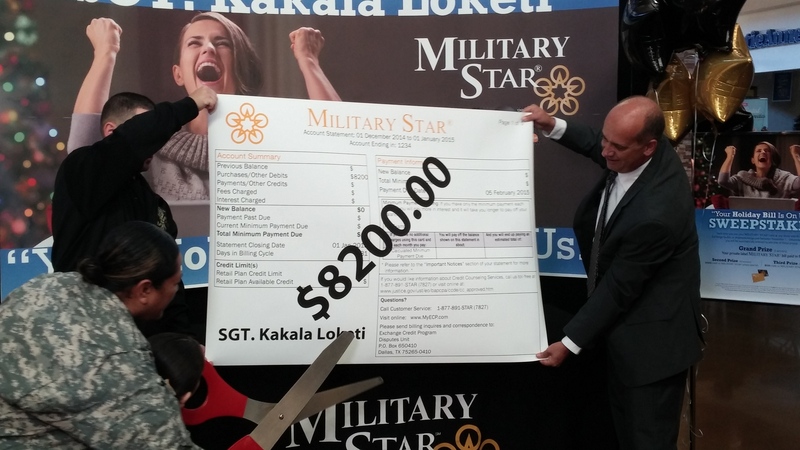 During a presentation at Freedom Crossing at Fort Bliss, Loketi took scissors to an oversize MILITARY STAR® statement, symbolizing her $8,200 bill being wiped clean. Loketi, who will soon head to Korea for a yearlong deployment, said she primarily used her card for family emergencies. She also would help young Soldiers in her unit who were low on money by buying them basic necessities, including gas. “The MILITARY STAR® Card allowed me to take care of my Soldiers,” she said. Two Army retirees also received grand prizes in the worldwide contest. Retired Col. Steve Schwaiger, who was stationed at Joint Base Langley-Eustis and now works on base as a civilian contractor, received a $2,500 credit. Retired Army Lt. Col. Jon Riches, who lives in Abilene, Texas, also received a $2,500 account credit during a presentation at Dyess Air Force Base. For Schwaiger, his prize came at the perfect time. He and his wife just bought their first home. His wife and teenage daughters are weighing in on how to spend his winnings. “I’m taking everyone’s orders—it’s kind of like a Christmas dream list,” he said. Riches, an 80-year-old Vietnam War and Operation Desert Storm veteran, hasn’t decided how he will spend his prize. He says visiting Dyess and shopping at the Exchange strengthen his military connection. The MILITARY STAR® card is a line of credit for use at the Exchange—no matter where military members serve. During November and December, shoppers were automatically entered in the sweepstakes each time they used their MILITARY STAR® card to pay for purchases at any Army or Air Force Exchange location or on shopmyexchange.com. The Exchange received nearly 4 million entries in the worldwide contest. Besides the grand prizes, 10 second-place winners received $1,000 statement credits, and 25 third-prize winners earned $500 credits. A complete list of winners can be found at www.myecp.com. DALLAS – Three young scholars have learned that good grades can pay off in a big way thanks to the Army & Air Force Exchange Service’s You Made the Grade program. Anastasia Newsome, 13, won the grand prize in the program’s semiannual sweepstakes. 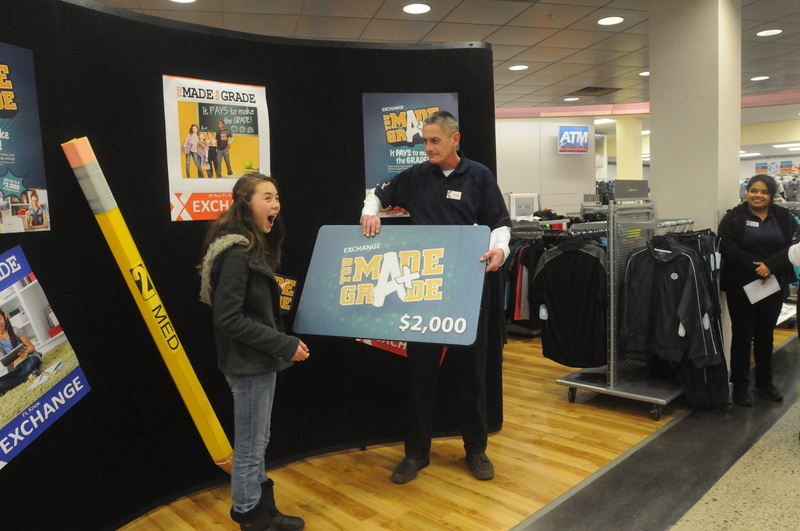 Anastasia, a seventh-grader in the gifted-and-talented program at TK Stone Middle School in Elizabethtown, Ky., received a $2,000 Exchange gift card during a surprise presentation at the Fort Knox Exchange. Her father, Brian Newsome, who medically retired from the Army in 2004, didn’t tell her she had won the sweepstakes, leading Anastasia, a straight-A student, to believe that he had won a prize instead. Nathan Tuttle, a sophomore at Key West High School, took home the second prize, a $1,500 Exchange gift card. Nathan, who has an A average, entered the drawing at the Wright-Patterson Air Force Base Exchange. His father, retired Air Force Col. Ron Tuttle works for the Air Force Institute of Technology at Wright-Patterson, telecommuting from the family’s home in Florida. Nathan is no stranger to winning. He earned a grand prize of $3,000 in savings bonds from the program in 2011. “It’s exciting to win—especially twice,” the 16-year-old said. For the third prize, a $500 Exchange gift card, two sisters turned sibling rivalry into sibling revelry. Megan Walters of Mooresville, N.C., daughter of retired Staff Sgt. Kevin Walters. Megan, a sixth-grader who earns straight A’s, received her prize during a presentation at the Fort Bragg North Post Exchange. Megan split the prize with her older sister, Sydney, a seventh-grader who also earns perfect marks. The sisters had entered the sweepstakes at Fort Bragg for the last few years, vowing to share the prize should either of them win. Through the You Made the Grade program, first- through 12th-graders with a B average or higher are eligible to receive a coupon book filled with Exchange discounts and a sweepstakes entry form for a shot at a $2,000, $1,500 or $500 prize. Drawings are typically held in June and December. DALLAS – A $10,000 grand prize is up for grabs in the Army & Air Force Exchange Service’s latest “Because of You” contest. And, for authorized shoppers, entering is as easy as visiting shopmyexchange.com. With the Spend Free Spree contest, military shoppers have a chance to win a $10,000 Exchange gift card, or a $2,000 gift card for second place. From Feb. 13-28, authorized Exchange shoppers can enter at shopmyexchange.com/Because OfYou. The contest is part an Exchange yearlong effort to recognize service members’ unique contributions to our country. Complete contest rules can be found at shopmyexchange.com/BecauseOfYou. Winners will be notified on or about March 15. The Army & Air Force Exchange Service goes where Soldiers, Airmen and their families go to improve the quality of their lives through goods and services provided. Exchange earnings provide dividends to support military morale, welfare and recreation programs. The Exchange is part of the Department of Defense and is directed by a Board of Directors, responsible to the Secretaries of the Army and Air Force through the Chiefs of Staff. To find out more about the Exchange history and mission or to view recent press releases please visit our Web site at http://www.shopmyexchange.comor follow us on Twitter at https://twitter.com/ExchangePAO.